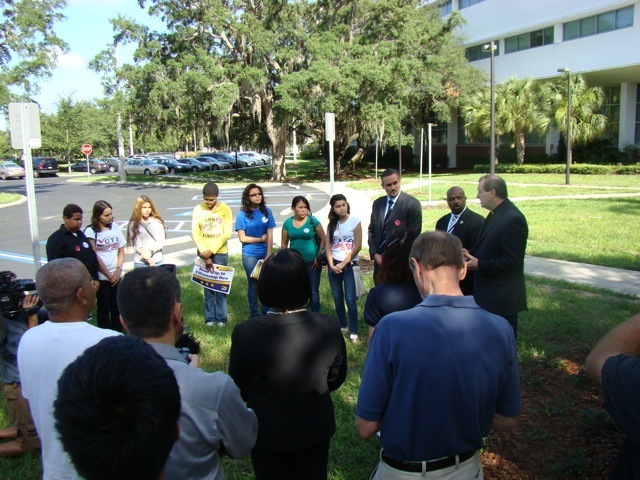 Yesterday, a pro-immigration crowd gathered at Marco Rubio's Tampa office, followed shortly by a press conference to encourage Senator Rubio to walk away from the current bill he is co-sponsoring in the Senate. 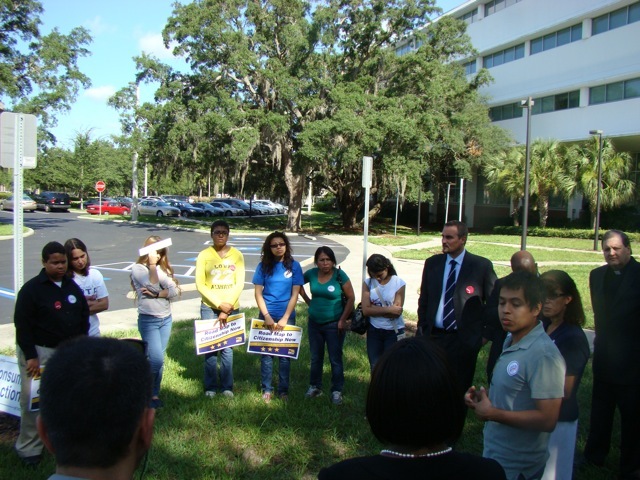 TAMPA ­­- Neatly illustrating the political tightrope Florida Sen. Marco Rubio is walking on immigration reform, pro- and anti-immigration reform advocates both held demonstrations outside his office Wednesday. In an ironic reversal, the pro-reform crowd of immigrant advocacy groups, usually Rubio's political opponents, praised him for pushing the "gang of eight" reform bill and urged him to stay the course. The anti-reform crowd of tea party activists, including some of Rubio's earliest backers, complained bitterly that he has betrayed them by supporting the bill. "I believed Sen. Rubio in 2010 when he said we've got to secure the borders first ... (and that) an earned path to citizenship is code for amnesty," Tampa Tea Party chairwoman Sharon Calvert said. "We're here to hold him accountable," said Barbara Haselden of the South Pinellas 9-12 Project. Rubio was not there, he was in DC, where he read part of Sharon's email to him on the Senate floor. You can read that full letter here. 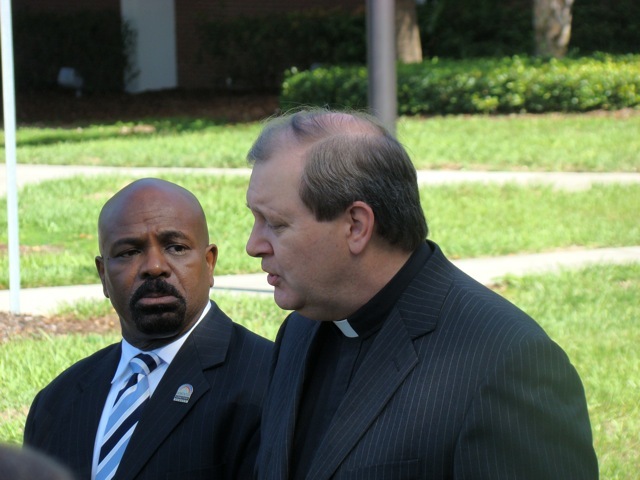 Here is a video of the full press conference of the Tea Party and Tampa 912. The first pro-immigration demonstration, around 9:30 included Mi Familia Vota, Rainbow Push Coalition, "and the politically active Service Employees International Union." According to one attendee, there were 33 total attendees, including 9 "media" (cameramen, reporters, videographers), 7 "organizers", and 8 (at least) interns. One of the two speakers of the 2 was upset because when his father, here illegally, had a heart attack, and went to the emergency room to get free healthcare. Tthey (the rest of his family, apparently also all here illegally) were looking over their shoulders the entire time because there was a police officer nearby. Thankfully, it all worked out fine in the end, he's back to work in South Carolina. The pro-immigration event lasted about 20 minutes. They offer free pizza if you come to make phone calls at their office. They opened and closed with a prayer. Who leads Mi Familia Vota? Several have ties to organized labor. Just thought you may want to know who their leaders are.